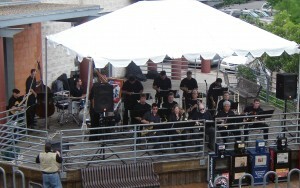 The North Austin Jazz Orchestra plays at the inaugural TCMF in 2006. Today, they’re known as NAJO, and will be appearing at TCMF IX, Sunday, April 27, at 5:15pm! Austin — The Ninth Annual Texas Community Music Festival kicks off Saturday, April 12, at 11:00am at Central Market North, 4001 N. Lamar, in Austin. The festival will be presented from April 12 – 27, virtually every day and evening of the week. TCMF will NOT be presented on Tuesday, April 15 and Easter weekend, April 17-21. Please check our schedules for times for all performances. Because two TCMFs were presented in 2013, this is actually the Tenth Texas Community Music Festival, which of course means, we can celebrate Number 10 this year as well as our Tenth Year in 2015. And this year, we want to salute and thank the many great musical organizations performing this year who participated in TCMF in our very first festival in 2006. Among those who played at the inaugural TCMF are: Austin Civic Wind Ensemble, the festival’s founding organization, Band of the Hills, Austin Jazz Workshop, Republic of Texas Big Band (known then at El Grupo Lunes), Austin Polka Band (known then as The NEW Austin Polka Band), NAJO (known then as the North Austin Jazz Orchestra) and the Austin Brass Band (known then as the Austin Wonder Brass). This year’s festival features performances by so many returning ensembles, as usual. And, as usual, we will be featuring performances by first timers as well, including the Central Texas Trombone Choir, Kupira Marimba, Lee Jaster, Texas KGB, Austin Lyric Opera, Yes Ma’am! Brass Band, Poor Yorick, Classics ‘N Jazz Brass Quintet, Waking Fable, The Bare Feat, House of Rock and Roll, Get It Good, and Lake Bottom Jazz Band. Like the musical landscape of Texas, TCMF continues to bring you an ever changing lineup of community bands! Make plans to join us for 10 glorious days of music and community! Every performance is family friendly. Every performance is FREE. And every performance will have you begging for more! Texas Community Music Festival is presented by the Austin Civic Wind Ensemble, graciously hosted by Central Market and sponsored through the generosity of Strait Music, and HEB. We also want to give special thanks to our community sponsors, Russell Korman Jewelry and Special Addition.